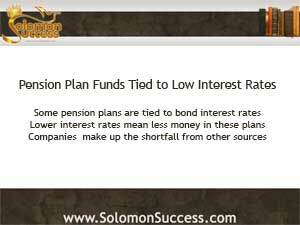 Solomon Success > Blog > Low Interest Rates = Vulnerable Pension Plans? Low Interest Rates = Vulnerable Pension Plans? A number of King Solomon’s proverbs portray old age as a time for dignity and prosperity, when people can reflect on their accomplishments and use their wisdom to guide younger generations. For many US workers in our modern world, though, that picture of retirement life may be nothing more than a vanishing dream, thanks to the current pension plan crisis that leaves workers with less of their promised benefits – or none at all. Now, another threat to pension plans is emerging: low interest rates, which are forcing some companies to dip into quarterly earnings to ensure that employees have at least some retirement income. According to a new article in the Wall Street Journal’s financial section, the low interest rates encouraged by US fiscal policies to stimulate borrowing and boost the economy have also had the unintended side effect of creating pension shortfalls, especially among major corporations. To prevent these shortfalls from draining employee pension accounts, these businesses now must move money from other areas of their operations into keeping pension plans afloat. The connection between pension plans and interest rates has to do with the fact that companies must calculate the present value of the future pension liabilities using a “discount rate “ that is based on the yield rates of corporate bonds. And as those rates fall, so do pension liabilities. The result is a shortfall, most likely temporary, or so the affected companies hope, that could reverse if bond rates begin to rise. This comes at a time when pension pans everywhere are struggling. Although it seems that these plans have always been a key part of working life, they didn’t gain nationwide popularity until the mid 1940s as more and more companies began to offer them as a way to compensate workers and ensure their continued loyalty to the job without pay raises. But as the workforce grew, the pension plan concept began to show cracks. The financial liability of offering defined benefit plans to all employees working until retirement age began to take a toll as early as the mid -1980s, when many corporations and mid- to large-size businesses began to search for alternatives such as the 401(k) plans that required employee input. Now, a combination of economic factors has made traditional retirement plans an uncertain proposition for employees in both private and public sectors – and low interest rates now add another complication. The Wall Street Journal reports that overall, pension plan funding by 400 of the nation’s major corporations fell by $79 billion in 2012. Although these figures don’t reflect the pension struggles of small and mid-sized businesses, they do demonstrate the toll pension plan maintenance can take on a company’s earnings – a toll offset in some companies by cutting pension benefits like health care, or outsourcing plans to third party managers. Of course, low interest rates help business too, encouraging borrowing that funds expansion and supports the consumption that fuels economic growth. Some companies, though, are borrowing to pay for pension funding – a case of robbing Peter to pay Paul that, experts warn, may have consequences later on. For now, though, the influx of funding to support weak pension plans underscores the vulnerability of these plans – another reason to take advantage of the current low rates to build an alternative income stream for the kind of retirement King Solomon envisioned through income property investment, as Jason Hartman always advises.